The weekend before Christmas, I was lucky enough to be taken by my gorgeous friends J and Miss C to dinner at Sydney's hottest, newest restaurant. Ms G's (a monosodium glutamate play on words) is the new Merivale restaurant in Sydney and the second for Lotus star chefs Dan Hong and Jowett Yu. 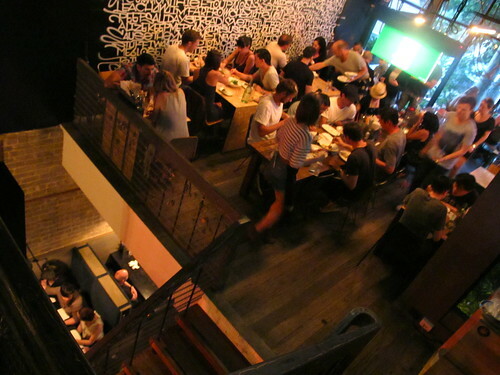 Hong and Yu have created a CRACKERJACK fusion menu influenced in part by research trips to New York (Dan Hong was responsible for the David Chang dinner at Lotus when the Momofuku bad boy visited Australia last year). Every aspect of the venue has been designed to within an inch of its life, but I couldn't help but love the way the ropes, glass walls and greenery outside gave the upper dining space a touch of the jungle. 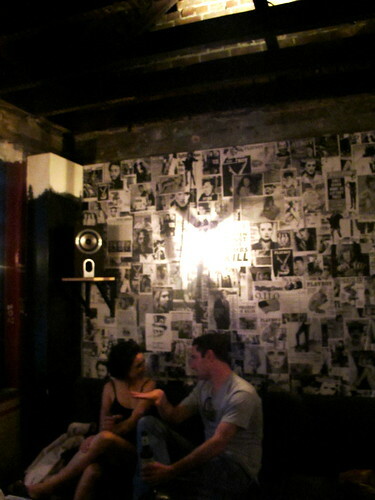 Having opened only a few days before, the place was packed for a Sunday night and the speakers were blasting tunes from the DJ upstairs (later on the music mellowed considerably and we were treated to some damn fine Al Green love and happiness and Little River Band reminiscing). The top bar is all exposed beams, ropes, buckets and pulleys. Many of the mixed drinks come in plastic cups which the bar staff then seal with cellophane using a machine, and serve with a huge straw (like bubble tea). 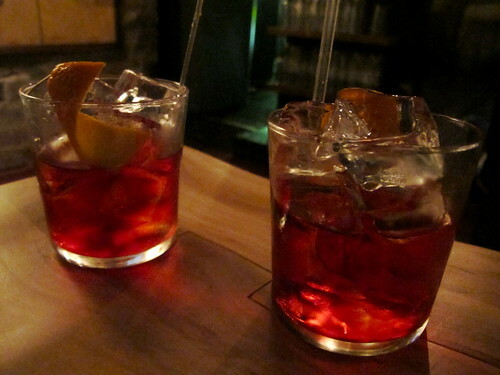 We started with stiff negronis. 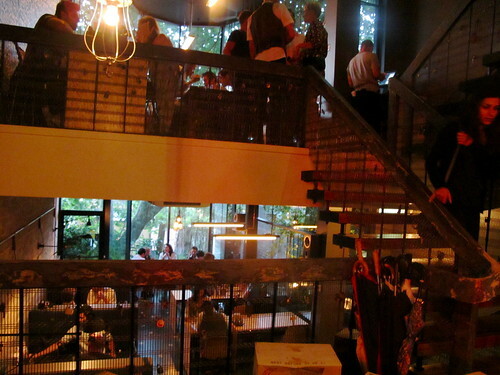 With two bars and two dining areas, Ms G's is split over four levels (well, six if you count the kitchen in the sub-basement and the toilets in the sub-sub-basement). Look carefully at the centre of the photo below and you'll see Sydney Harbour Bridge! 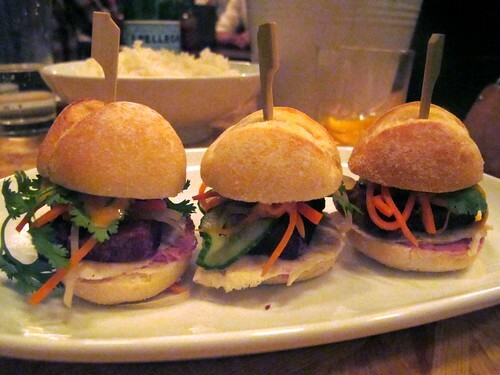 Unless you're vegetarian, you'd be crazy to NOT start your meal at Ms G's with one of the sensational mini bánh mì ($6 each), sexed up with pork belly and chicken liver parfait. AND it would be a crime to skip the grilled corn on the cob ($3.50 each), according to our waitress directly inspired by the ones at Cafe Habana (which I saw on my last trip to New York). 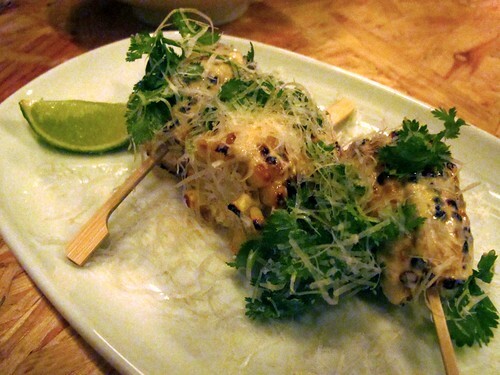 At Ms G's the corn is slathered with parmesan and lime, plus cumin and smoked paprika to provide the heat. Sydney's answer to Melbourne's Mamasita elotes callejeros! 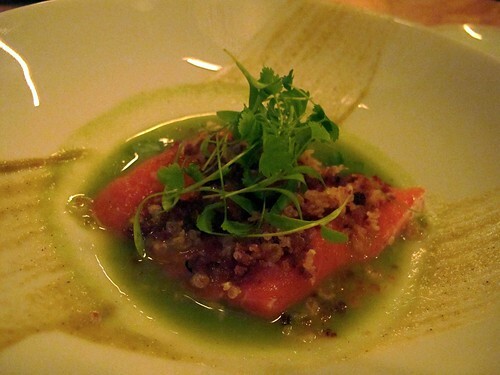 I was also a huge fan of the ceviche ($15) of Aoraki king salmon, jalapeño purée and tiger's milk ($15). Tiger's milk, known as leche de tigre in Peru, is the fishy lime marinade from the ceviche regarded by Peruvians as both an excellent hangover cure (taken in a shot glass) and an aphrodisiac. 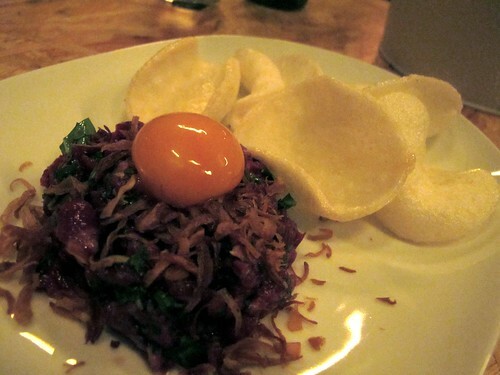 Oh, and the Vietnamese steak tartare with fried shallots and prawn crackers ($18)? RIGHTEOUS. 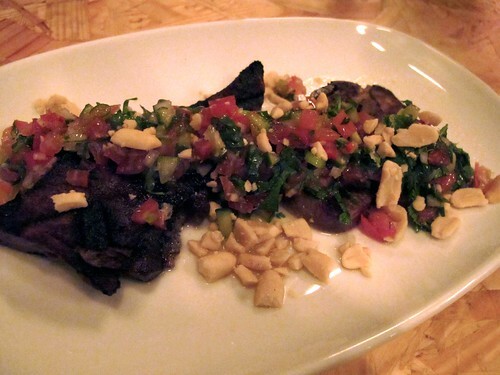 J ordered us the grilled beef tongue with lemongrass and tomato salsa ($14) and Miss C put in a vote for the grilled calamari with black pudding and coriander salsa verde ($14). 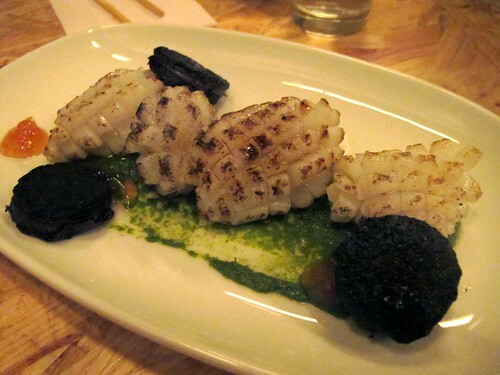 The tongue was marvellously tender but the same could not be said for the calamari - probably my least favourite dish. 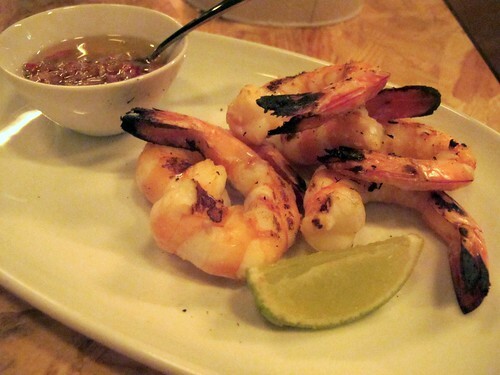 But we all loved the mains we shared: the $28 grilled king prawns with sambal matah (a Balinese raw eschalot, lime and lemongrass sambal) and a half serve of Korean fried baby chicken with kimchi mayonnaise ($15, or it's $25 for a whole baby chicken). 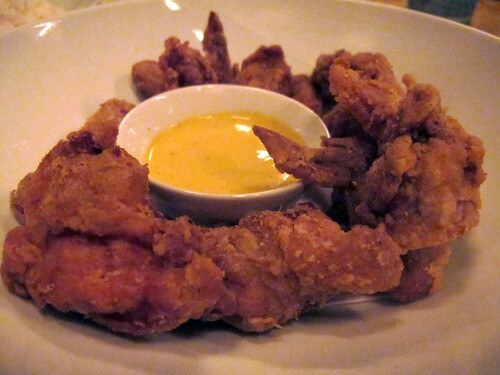 The chicken pieces were perfectly crispy but lusciously juicy on the inside, and addictive with the kimchi mayo. 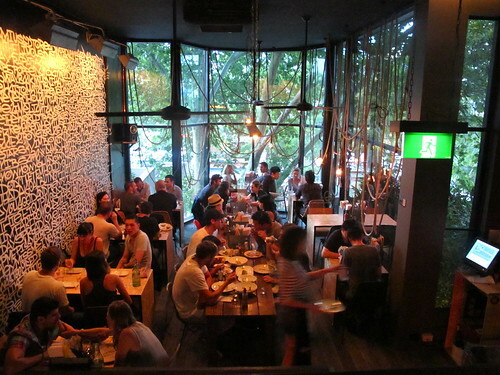 Given the New York connection, it'll be interesting to compare Ms G's to David Chang's Sydney restaurant once the latter opens. Irrespective of when that happens, I'm just hankering for another trip up north to Sin City ASAP so that I can try a few more dishes on Ms G's menu, like the egg noodles with XO sauce, braised duck and soft poached egg, or the "Stoner's Delight" dessert of banana ice cream, chocolate, rice bubble, pretzel, peanut brittle and marshmallow. Oh, and kaffir lime shochu and gin served in paddle shots. Can I get a HELLS YEAH?! As a proud Melbourne person, this is a painful question to ask. But after reading your recent entries about Sydney restaurants, is Sydney now offering far more exciting dining experiences than Melbourne? A great post. It's interesting to read the earlier comment. 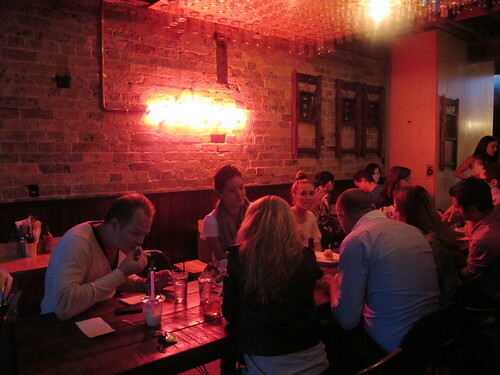 Having just returned from three weeks in San Francisco and New York, I think Melbourne is still a great place to eat, however, lot of other places are equally good. Sydney has improved out of sight (having spent three years there since 2005). One thing that I've reflected on since coming home to Melbourne is that it's become quite expensive, relative to cities I've spent time in, like New York and Sydney, for comparable food experiences. Whether it's at the upper end, or simpler, but still fabulous, places like Cafe Habana (mentioned in this review). 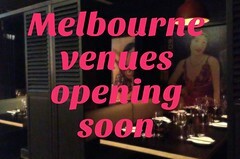 I also think, broadly speaking, service in Melbourne has lost it's edge in recent years. 'sexed up with pork belly and chicken liver parfait'- love it! Witty name, good food, fun company and a clever way to disguise your mixed drinks. 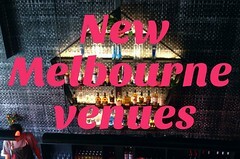 Still happy with Melbourne though but I may go here when I'm in Sydney. 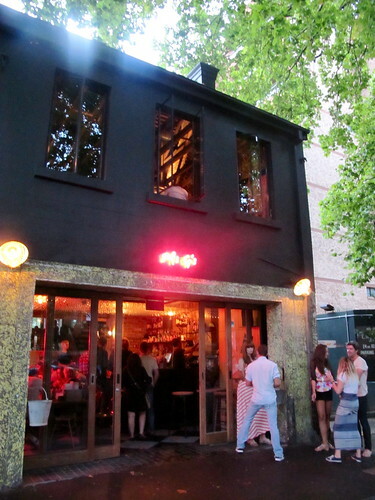 How achingly trendy is Ms G's? 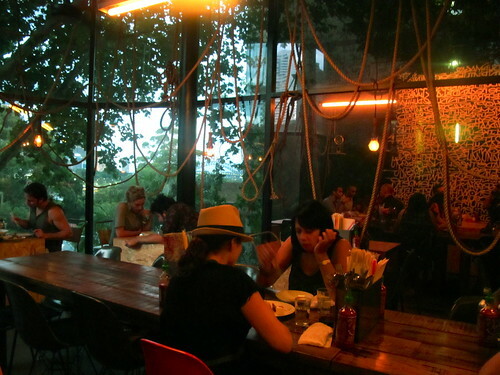 Love your photos of the place, makes me want to frock up and down a banh mi or two. Gorgeous review!! I am incredibly excited to try out this new restaurant! Thanks again! I just headed there last night and loved it! 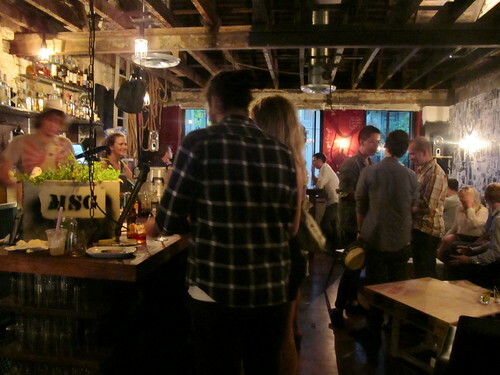 It was totally packed, great service, amazing food and fab cocktails! The only thing that we needed were larger stomachs to fit more food in! You got some great pics of it! Another Sydney restaurant that doesn't take bookings, and a gentle reminder of how painful Sydney has become. I was looking forward to coming home for a week (from Hong Kong where I now live) but as I try to book things to do, it reminds me of why I left. Standing around for 1-2 hours waiting for a table is just not cool, and does not fly by world standards.